Coarsely grind the duck meat, along with its fat, in the meat grinder or food processor. It is important to keep the meat as close as possible to freezing, without being frozen, to inhibit bacteria from growing. Since duck is so fatty, use about 1/3 fat and 2/3 meat for this mixture. Pork fat can be used if the duck is not fatty enough. Do not overgrind the meat, or the fat will become pasty. Add the water to your instant cure and stir until dissolved. Pour it with the rest of the spices into your meat and mix thoroughly. If you use your hands to mix, it is wise to use gloves to keep the curing mixture from getting on your skin. Place the meat mixture into the gallon-size plastic bag. Squeeze out as much air as your can and close it. Place in the refrigerator to cure for 24 hours. Thoroughly clean all surfaces and containers with hot soapy water. Soak your casings for about an hour before you stuff them. Place them over the end of a large funnel, or whatever sausage stuffing attachment you have. Tie one end with the cotton string tightly with a knot about 2 inches up from the end. Push the meat mixture into the casing, squeezing out the air pockets and pushing the meat into a tight tube. When all the meat is pushed in, twist the end and tie it tight with the cotton string. Trim the end of the casing and string so they are about an inch long. 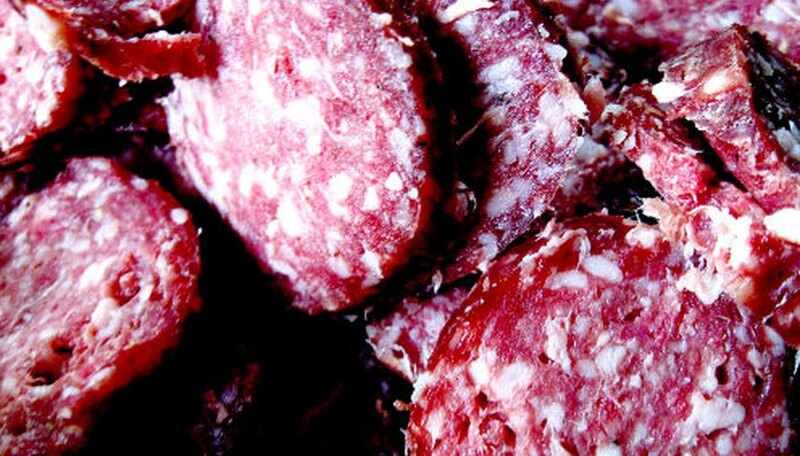 Place the raw salami into a 300 degree oven and bake for at least 2 1/2 hours, or until the internal temperature of 160 degrees has been steady for 10 minutes. Remove the salami from the oven and cool. Wrap in paper and refrigerate. Slice as needed. Preheat a wok or deep saucepan over medium-high heat until hot. Add at least 2 inches oil; heat to 365. Deep-fry the won ton in batches, without crowding and turning occasionally, for 2 to 3 minutes or until golden brown. Remove with a skimmer, drain on paper towels. Put won tons in a shallow 3-quart soup tureen. Bring chicken stock, soy sauce, sherry and white pepper to a boil in a large stockpot. Stir in cornstarch mixture and cook until soup thickens, about 15 seconds. Fold in sesame oil. Remove stockpot from heat. Lightly beat the egg whites just to break them up a bit. Stir soup in a circular motion while slowly and in a steady stream pouring in the egg whites. The whites should set within seconds into a lacy pattern. Pour soup over won tons, garnish with chopped onions, cilantro and Smithfield ham. Serve hot. Place the wine in a saucepan over medium-high heat. Mix the Swiss cheese and flour together and gradually add to the wine, stirring constantly, until all the cheese is melted and mixture is smooth. Remove from the heat and add the brandy, garlic, onion, pepper, and ham. Pour into a chafing dish and sprinkle with nutmeg. Serve hot. Makes about 3 1/4 cups of dip. I prefer the liquid certo to the powdered. It seems to jell better with flowers. Also, I find the extra minute of boiling helps to create a stiffer jelly, though 1 minute will create a clear jam-like texture. I always use the 4 oz canning jars because I can give away some of the jellies without running out of all my stock. Rose petals have a bitter white bit where the petals join the flower. Cut these off. I do this by holding the flower, stem up, and cutting around the flower, leaving all the bitter bits on the flower. I've used Rose, Honeysuckle, Lavender, and many herbs too. Rosemary makes a good jelly for a glaze on roast pork (and probably lamb). Lemon verbena and spearmint are great too! Thanks to Flower-Recipe egroup for this recipe. Position knife blade in processor. Add half of corn. Process until finely chopped. Add remaining corn. Stir well & set aside. Combine cornstarch & water in a small bowl; stir well & set aside. Combine chicken broth & gingerroot in a large saucepan; bring to a boil. Add corn, cornstarch mixture, creamiest, green onions, pepper & rice vinegar. Bring to a boil. Reduce heat & simmer uncovered 3 min. Wash and dry the lettuce leaves; cut or tear into bite-size pieces and place into a salad bowl. Add the remaining ingredients and toss lightly. NOTE: Lightly toasted sesame seeds may be substituted for the walnuts. To make moretum more authentically, use only two lettuce leaves; place them and the remaining green ingredients into a blender and blend well. Transfer to a mixing bowl, and add the cheese and ground pepper. Form into a ball. Add the vinegar and oil in sparing amounts. Wash, trim and roughly chop the rhubarb, put it into a pan and cook gently until it starts to soften. Stir in the sugar and when it has dissolved add the blaeberries and bring the jam to the boil. Boil it rapidly for up to 20 minutes to setting point. Cool slightly then pour into clean warm jars, cover, label and store. Tangy fresh cranberries need to be cooked first in a light syrup to reduce their tartness before being added to stuffing. Stir a tablespoon of the drained cooking liquid from the cranberries into a glass of chilled white wine for a holiday cocktail. Remember this recipe when preparing stuffing for pork chops, a crown roast of pork, roast chicken, or turkey. 1. In a medium saucepan, bring the sugar and 1 cup water to a boil over high heat, stirring often to dissolve the sugar. Boil for 3 minutes. Add the cranberries and cook until the skins split, about 3 minutes. Do not overcook; the cranberries should remain relatively whole. Drain them in a wire sieve. 2. In a large skillet, melt the butter over the medium heat. Add the onion and celery and cook, stirring often, until the onion is golden, about 8 minutes. Add the ginger and stir for 1 minute. 3. Scrape the cooked vegetables into a large bowl. Add the cornbread, drained cranberries, and almonds. Gradually stir in the eggs and about 1 cup broth, until the stuffing is evenly moistened but not soggy. Season with the salt and pepper. Use as a stuffing. Or place in a lightly buttered casserole, drizzle with 1/2 cup broth, cover, and bake as a side dish. Excerpted from 50 BEST STUFFINGS AND DRESSINGS by Rick Rodgers Copyright© 1997 by Rick Rodgers. Excerpted by permission of Broadway, a division of Random House, Inc. All rights reserved. No part of this excerpt may be reproduced or reprinted without permission in writing from the publisher. DRESSING: Crumble cornbread and toasted bread in a large bowl. Add onion, chopped boiled egg and chopped celery. Add boiling broth to mixture. Add crumbled sage leaves. Salt and pepper to taste. Add raw eggs and melted margarine. Blend well. Pour into a buttered baking dish and bake at 425 degrees for 20 to 30 minutes. CORNBREAD: Mix cornmeal, flour, eggs, and buttermilk in a bowl. Pour into a well greased pan. Bake at 425 degrees for 20 to 25 minutes or until done. NOTE: I like more sage, some one else may like less. In a small saucepan, combine the wine and lavender. Bring to a boil and reduce to the consistency of marmalade. Strain and reserve the liquid. Chop the lavender finely if you wish to add it, otherwise it can be discarded. In a mixer, combine the cream cheese and 1/2 cup of the sugar at low speed. Add the lavender liquid (and the lavender if you choose). Mix until smooth. Pour into a buttered 9" springform pan and bake at 325º for 45 minutes. Remove from the oven and let sit at room temperature for 30 minutes. Combine the sour cream and 2 Tblsp. sugar, or more to taste, and spread over the cheesecake. Bake at 400º for 4 minutes. Chill at least 3 hours. Garnish with crystallized rose petals and silver pearls. Beat the egg white until frothy and brush it lightly onto each rose petal. Sprinkle with sugar and let dry. Clean, core and slice cabbage very fine. Add mayonaise and mix thoroughly. Add minimarshmallows. Strain pineapple and add to mixture. Whip cream until peaks form and add. Toss mixture well and refrigerate 2 hours befor serving. Note: Peelen adds a small amout of sugar to sweeten. Make the turkey broth. To make the broth, put the turkey carcass in a stock pot with 12 cups water. Turn the heat on high until the water boils, then turn the heat to medium, cover the pot and simmer for one hour. Skim off any foam using the long-handled spoon. In lieu of making the broth from scratch, you can use 12 cups (6 cans) of chicken broth. Cut the vegetables and turkey meat into bite-sized pieces using your knife while the broth is simmering. Remove carcass from pot and discard. Add vegetables, bay leaves and poultry seasoning to the broth. Turn the heat to high and bring the soup to a boil. Once the soup is boiling, turn the heat to medium, cover the pot and simmer the vegetables for 20 minutes or until the carrots start to get soft. Add the pasta noodles and turkey meat to the pot. Cover and continue simmering another 10 minutes or until the noodles are cooked to your preference. Chop fine all vegetables including tomatoes and the potato. Drain soaked beans, discarding liquid. In a medium pot, add olive oil and butter. When oil is hot, add chopped carrot, onion, celery, tomatoes. Saute, but do not brown. Add chopped potato, paprika, and chicken stock. When this reaches a boil, add kidney beans and turn down heat to a simmer. Add tomato paste. Let cook 45-60 minutes, stirring occasionally. When beans are soft to the touch add sausage and cayenne pepper. Season to taste.